Prominent & Leading Wholesale Trader from New Delhi, we offer ultrasonic doppler flow meter for accurate flow measurement, time transit ultrasonic flow meter d118, ultrasonic portable flow meter for dirty & aerated liquids, ca serial ultrasonic flow meter with picofly technology, multipath ultrasonic flow meter d348d plus and portaflow pt500 flow meter with data logger and sensors. Ideal for full pipes and any liquid containing gas bubbles or solids larger than 100 microns and in concentrations greater than 75 ppm. 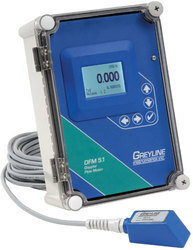 The DFM 5.1 flow sensor installs without cutting the pipe. It takes just a few minutes to mount on the outside of any pipe. Calibration is easy with the built-in, 5-button keypad. No Contact means no maintenance, no sensor fouling, no obstruction to flow, no pressure drop, no corrosion and no pipe cutting or drilling for installation. 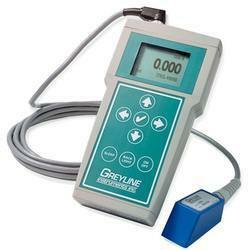 Use a Greyline PDFM 5.1 Portable Doppler Flow Meter to monitor and balance flow, or to troubleshoot flow problems in pipes. It is ideal to full evaluate performance of in-line flow meters and can be installed, calibrated and started-up in minutes. 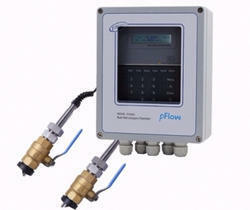 The flow rate of any fluid can be measured as long as it contains air bubbles or solids. It is ideal for wastewater, slurries, sludge, and most chemicals, acids, caustics, and lubrication fluids. With two pairs of Transducers, the PT500 works on a wide range of pipe sizes from 0.51 to 78” (13 to 2000 mm) pipe diameters. 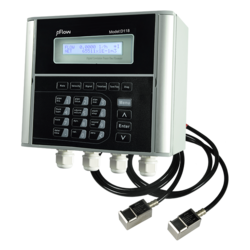 It includes a 98,000 point data logger with USB and RS232 outputs. The simple, quick-start calibration system calculates sensor separation distance based on pipe diameter and pipe wall material. Flow is displayed in your choice of engineering units. Data can be stored in selectable intervals from 5 seconds to 1 hour and displayed on the instrument in text or graph format. 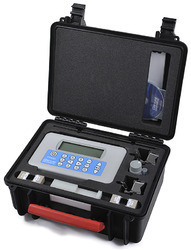 The PT500 includes a watertight IP67 rated carrying case with foam padded compartments for the flowmeter components. Compact, rugged and reliable, the PT500 is designed for accurate performance in a wide range of industrial applications and environments. minute or hour), and flow velocity in feet per second or meters per second. Displays positive and negative flow and data log files in graphic or text modes. calibration parameters for up to 20 different sites. for use in hazardous rated locations. 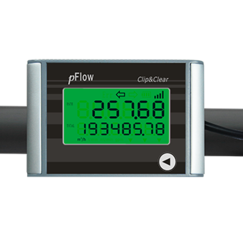 P118i Portable Ultrasonic Flowmeter enables the user to do flow measurement checks at many points in a flow process without the need for a permanent installation. This ultrasonic flowmeter adopts Gentos unique PICOFLY time measurement technology, which could make the resolution reach to 10 picoseconds (0.01 nanosecond). It realizes the high respondence and high accuracy ultrasonic measurement technology and application. Order with ‘A’ Transducers for 0.51 to 4.5” (13 to 115 mm) outside diameter pipes, or ‘B’ size for 2 to 39.4” (50 to 1000 mm) pipes. Use it on any solid metal or plastic pipe material. 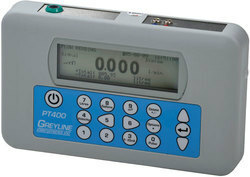 The PT400 displays, totalizes and transmits with isolated 4-20mA and programmable pulse outputs. The rechargeable NiMH batteries will power the unit for 16 hours continuous operation and charges overnight. It takes just a few minutes to install the Transducers and measure flow from outside the pipe. Measure flow in volumetric units (gallons or liters) or switch to velocity units (ft/sec or m/sec) with a single key press. Forward and reverse flow is displayed and totalized on the large, backlit display.